Peter Fagan initially began producing bronze animals and objects. These were successful but interest really grew with the creation of a painted bronze cat. 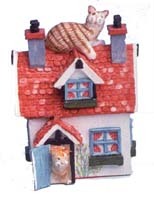 Peter Fagan changed the bronze for a ceramic resin and put his cats in a variety of situations and, in 1983, the Home Sweet Home collection was created. 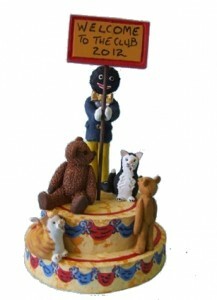 The cats were an enormous hit and the Colour Box Teddies, which first appeared in 1987, have also been hugely popular. The Teddy collection, many modelled on Peter’s own antique teddy collection, reflects all styles of teddy bears. Each teddy is accompanied by its own story. Although Colour Box closed in 2000, Peter still continues to model his popular pieces today from his home in Berwick Upon Tweed.